Eagle RM-1000 Whole House Alkalizer, Remineralizer and Acid Neutralizing Water Filters contain naturally occurring calcium carbonate media along with another proprietary media to give a higher pH boost. 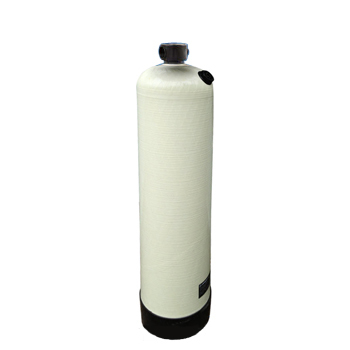 It is used to neutralize acidic or low pH waters to a neutral, less corrosive effluent. Also adds minerals back for great tasting water after whole house reverse osmosis systems. Is capable of getting larger pH boost than a traditional acid neutralizers. We only use natural, crushed and screened white marble calcium. Acidic water can leach unhealthy levels of copper from pipes and cause greenish-blue stains on fixtures. It can cause many other corrosion problems as well and drastically shorten the life of all water using equipment, including dishwashers, washing machines, hot water heaters as well as fixtures. When acid pH water (below 6.8) is passed through the filter, calcium carbonate is slowly dissolved into the water, increasing the pH to a neutral level. The alkalizing-remineralizing media slowly dissolves over time and will need to be re-filled about every 2-4 years, depending on the amount of water you use, and the pH of your raw water entering the unit. We offer replacement media to refill the tank for a long-lasting operation. The optional Fleck automatic backwash controller can be set up to do periodic back wash, which improves media performance. Manual backwash controller is also available. Replace Media after: 1.5 cu.ft - 2-4 years, 2 cu.ft - 3-5 years . This is an excellent solution for acidic water that will balance pH and increase water alkalinity whether for Well or municipally treated water. Great as a post tank to a Whole House or Commercial Reverse Osmosis System.